An eighth of an inch. That’s about as big as a flea gets. How could something so small cause such a big problem for so long? These little parasites are persistent, for one thing. In fact, according to scientists, fleas have been around for millions and millions of years. And for a long time, flea control was a difficult challenge. Until recently, the products that were available had issues around safety, efficacy and convenience. For years, our pets were bugged by the itchiness, irritation and more serious problems caused by these pests without any real answer in sight. Thankfully, those days are over. Today, your veterinarian can recommend many products that can safely and effectively protect your pet from fleas. The most important thing an owner can do to protect a pet against fleas is prevent them, says Dr. Michael Dryden, professor of veterinary parasitology at Kansas State University and one of the leading experts on fleas. “By the time an owner notices fleas, it is essentially too late for the animal. 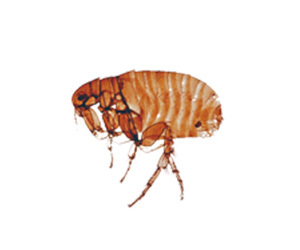 The flea life cycle is already occurring, and infestation and disease are already there.” To understand why this is true, it’s important to understand a little bit about fleas and their life cycle. It should be obvious if your pet has fleas, right? Unfortunately, not always. Even if you’re the most attentive pet owner and you’ve never seen a flea on your pet, your house could harbor a substantial flea problem. Fleas are not that easy to spot on a pet. Not only are they tiny, they are also usually very well hidden by the coat of most animals. So unless you’re actively looking for fleas, you might not know they’re feeding on your favorite four-legged friend. A telltale sign that might be more obvious is “flea dirt.” These tiny dark specks on your pet’s skin or bedding are actually flea feces containing digested blood. If you see what you suspect is flea dirt but you’re not sure, put the specks on a piece of white cloth or paper and wet them. If the specks turn red, you’ve got flea dirt. Because adult fleas live most of their lives on a host (namely, your dog or cat), this is probably the only stage of the flea life cycle you’re likely to encounter. However, adult fleas are just the tip of the iceberg. Within a few days of feeding, the adult female flea begins to lay eggs, as many as 40 to 50 per day. Within a few weeks or months, she can lay hundreds or even thousands of eggs. And that’s just one flea. Because of these tremendous reproductive abilities, adults usually make up only 5 percent of the fleas in the environment, with the other 95 percent of the population being in earlier stages. Untold numbers of tiny eggs, larvae and pupae (the cocoon stage) can be hiding out in the rugs, carpets, furniture and bedding throughout your house. Once they get to be adults, fleas need to find a host to feed on. And that’s where the problem often starts for pets. How can you know if your pet has fleas? The No. 1 sign is scratching. If you have a dog, you may notice that he bites, scratches or rubs a lot around his tail, back legs and abdomen. If your cat has fleas, other areas of his body, particularly the head and neck, may be affected as well. And though cats are famous for keeping themselves fastidiously clean, if your feline friend can’t seem to stop grooming, this can be another sign that she has fleas. “When fleas consume blood, they inject salivary proteins into the bite area,” Dr. Dryden explains. Some pets have a severe allergy to flea saliva, a condition called flea allergy dermatitis, or FAD. After being bitten, these pets will experience a prolonged reaction that causes them to be intensely itchy. Flea allergy dermatitis can strike any dog or cat and is typically characterized by skin irritation, hair loss and open sores that can leave the skin vulnerable to infection. Flea allergy dermatitis can make an animal miserable. If your dog or cat is diagnosed with this problem, eliminating fleas and then making sure they stay away from your pet permanently is absolutely essential. The problems that fleas cause can go more than skin deep, though. Fleas are often infected with >tapeworm larvae. If a dog or cat ingests an infected flea, the tapeworms will be released inside the pet and go on to infect its new, larger host. This means that if your pet has tapeworms, he almost certainly has a flea problem as well. Flea dirt also may harbor a bacterial agent that can cause cat scratch disease in people, which is often transmitted by an cat scratch or bite. With the return of warmer weather comes flea season, a time when flea populations rise dramatically in many areas of the United States. However, this is not the only time you need to worry about flea control. It’s important to remember that fleas have been found in all 50 states, and they can be a persistent threat to your pet indoors. No matter where you live, conditions inside are perfect for fleas to thrive and multiply, even in the dead of winter. And once fleas get a foothold in your home, it can be a challenge to get rid of the unwelcome guests. The bottom line is that it is essential that all pets — even those who stay strictly indoors — need protection against fleas at all times. “Why should we let animals suffer from flea infestations year to year? Dogs and cats should be on a year-round, lifelong preventive treatment regimen,” Dr. Dryden says. The good news is that there are now many excellent flea control products available. It’s easier than ever to protect your pet and your household from being taken over by these pests. In addition to being safe and effective, many flea preventives are designed to be convenient for owners struggling to keep up with today’s busy lifestyle. But with so many choices, how can you know which one is right for you and your pet? Not all flea control products are equal; they work in different ways, and some work much better than others. That’s why it’s important that you talk with your veterinarian. In fact, the best products on the market can be obtained only at your veterinary clinic. Several of these products need to be used only once a month, making it easy to fit into even the busiest schedule. As Dr. Dryden sums it up: “With the safety and ease of the products currently available to consumers, the most important thing is not which of the many effective products you and your veterinarian choose, it’s getting your pet started on a preventive regimen.” Together, you and your veterinarian can develop a flea control program that’s best for your pet, your household and your lifestyle. Many of us share our beds with our pets. If you have not yet started your pet on a flea control program, should you be worried about fleas biting you? Though fleas can and do bite people, a flea will choose a meal from a cat or dog before he’ll view you as a more tempting entrée. As a concerned pet owner, though, you need to get hopping on flea control measures to make sure your pet stops serving as flea bait. Though there are some illnesses associated with fleas, you shouldn’t worry too much about catching a flea-related disease from your pet. According to Dr. Dryden, “With all of the problems that fleas cause, disease transmission to people is generally not an issue.” However, he does point out that for individuals with impaired immune systems, the threat of contracting disorders like cat scratch disease should be taken much more seriously. If you have questions or concerns regarding specific risks to you or your family members, be sure to discuss them with the two individuals who can advise you best on this topic: your veterinarian and your personal health care provider.